The speciality of Python is that any number irrespective of its size can be represented. It doesn't have any size constraints like any other programming language. print() : The print() function prints the value inside the brackets onto the screen i.e. helps us to see the output. type() : The type() function is the one which we will be using in this tutorial to determine the Data Type of that particular variable. To know about any function and its usage, type the function name followed by a ?. 2. print(x) // This will print the value of variable x. 3. type(x) // This will data type to which x belongs. 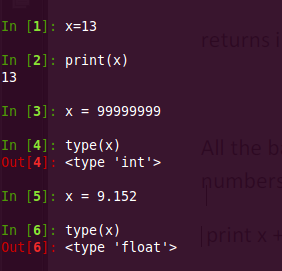 As I stated above that we Python can store value of any size so to check that again perform the above 3 steps with giving value as '9999999999' to x. i.e. x = 9999999999. When you use the type() function you will get to know the data type of the variable. 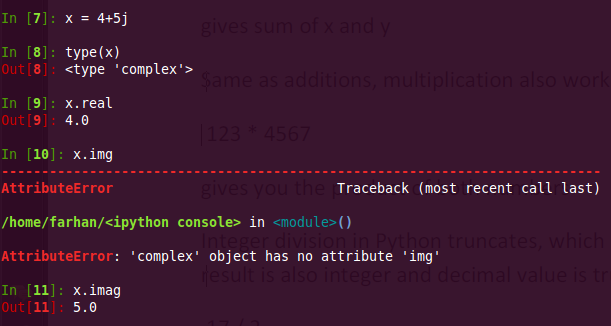 NOTE : Along with the traditional data types such as INT, FLOAT etc Python has an extra Data Type known as COMPLEX. The Below image shows that. Its a primitive datatype having one of the two values : True or False. 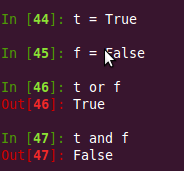 Python is a Case Sensitive Language, so True with 'T' is a boolean type but true with 't' would be a variable. We can do all kinds of binary operations i.e 'or' 'and' with these boolean variables. 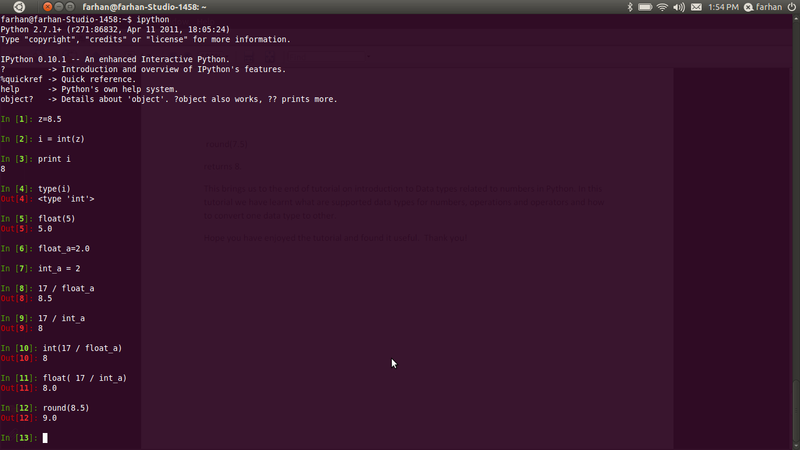 Python takes care of all the mathematical operations with all data types. 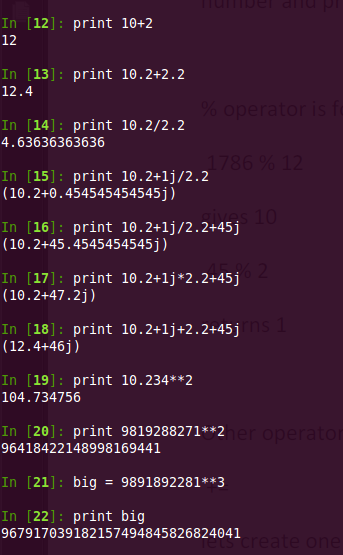 print x + y - Prints the addition of x and y.
print x * y - Prints the multiplication of x and y.
print x / y - Prints the division of x and y.
print x ** y - Prints the x raised to power of y. The Below image shows all of the above Mathematical Operations with int, float and complex data types. 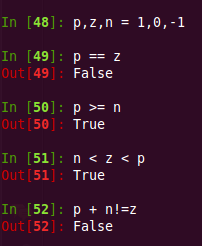 We can also check for multiple logical operations in one statement itself. gives True. This statement checks if 'z' is smaller than 'p' and greater than 'n'. Python also supports type casting and type conversion like any other programming language. In the above figure you can see the type casting done.